This week’s Old School Sundays is dedicated to the original players—Robert Herrick and Andrew Marvel. Both 17th Century British Poets (Marvell being of metaphysical variety) seemed to know how to woe the ladies—as evidenced in their poems below. TO THE VIRGINS, TO MAKE MUCH OF TIME. The second two stanzas take that same notion of time and applies it to thou fair maiden who is likely making a silly mistake by not making use of said time. Than languish in his slow-chapp’d power. Thorough the iron gates of life. 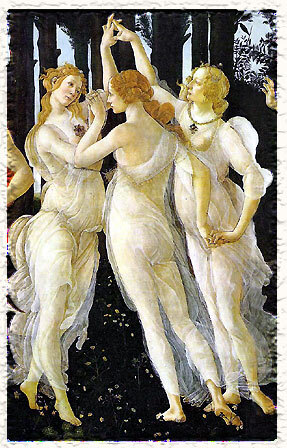 Botticelli. ‘Three Graces’ detail from ‘Primavera’ 1481. Damn, Marvell’s pretty good at this. Had I been around nearly three hundred years ago, he might have convinced me…well, maybe. The first stanza here is filled with allusions, or shall I say, illusions of time. He’s comparing this very charged moment with his mistress to the sands of time. I’d be willing to take things slow, he says, if we had the weight of the world’s time in our hands. If we did, I could admire your breasts for two-hundred years before we went any further. Instead of letting time dictate us, the seducer says, we can be the ones dictating time. How could any woman resist? Move over John Mayer. You got nothing on these guys. Interesting though, how Marvell takes so much ‘time’ to prove how much ‘time’ he and his mistress are supposedly wasting.